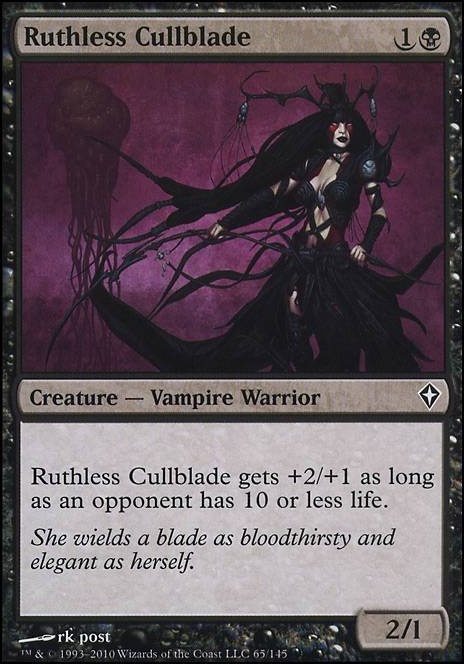 Ruthless Cullblade gets +2/+1 as long as an opponent has 10 or less life. Glad to hear I was of some help! As far as getting ahead with aggro goes, there's a couple things to keep in mind. You want to spend all your mana every turn to ensure your opponent is dead as fast as possible. In order to achieve that you want to keep your curve as low as possible - maximizing on 1-2 drops with 3 being top end and 4 being your absolute lategame. That in mind, you might want to drop a few 3s for some more 1-2s. Metallic Mimic, Stromkirk Condemned, Heir of Falkenrath Flip, and Asylum Visitor are all great options for the 2 slot, and Lightning Bolt is the biggest aggro piece you're missing from the 1 slot. Falkenrath Gorger would also be a reasonable call for the 1 slot. Ruthless Cullblade is great if your opponent is already at or below 10, but doesn't do much to actually help you get them there. I'd say it'd probably worth cutting in favor of one of the other two drops mentioned above. 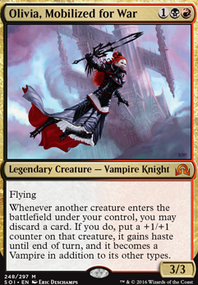 Rakish Heir would also be reasonable to cut for one of the above cards since it's easily the worst 3 drop vampire you have here. Thanks for the tip Silverdrake! I have been taking your comment to heart. When I made this deck I was using cards lying around. I have updated the list and made it a bit more consistent. I just dont know how much work Vampire Lacerator and Ruthless Cullblade is going to put in. 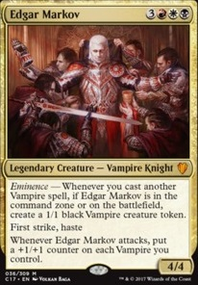 Any thoughts on how to get ahead with Aggro early and with Vampires? As an agro deck you should be careful about what kinds of lands and early plays you put into your deck. 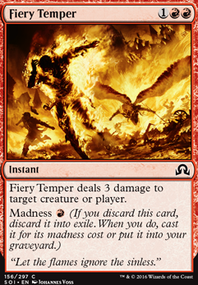 Playing a card like Despise means you're not playing a 1CMC creature which could take you off an aggressive path. Same goes for Scoured Barrens, since you want to play a 1CMC creature a lot more than you want to gain 1 life on turn one. Fairly cheap upgrades to the mana to ensure you are playing untapped lands are cards like Concealed Courtyard and Caves of Koilos. Solemn Offering is a sideboard card at best and should not be in the mainboard. Chief of the Scale is too defensive, Hateblade, Hordechief, Skullhunter, Pain Seer, Herald, and Hordemate are all fairly mediocre and certainly not worth putting you over the 60 card minimum and decreasing your efficiency. Playing more cards every turn with the 8 bobs (in the person of 4x Asylum Visitor + 2-4x Blood Scrivener) also does the trick. Vampires have Cavern of Souls over other midrange builds. They can have Lord of Lineage Flip over other midrange decks - if that card flips it runs away with the game right there (i have yet to see midrange decks in the format that can deal with a constant stream of 4/4 flyers - hell legacy miracles uses/used such things as win condition via Entreat the Angels. 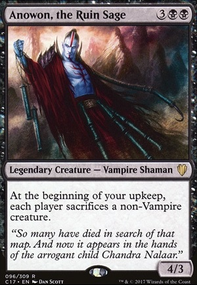 Vampire Hexmage + Phyrexian Etchings are pretty nice too - i would like to see which other tribe has such thing! Lets take a look at 2 cmc! Gatekeeper of Malakir - !that is 3 mana for all intents and purposes! How does an aggro deck win that is slower than others, lacks evasion, and its creatures are actively worse (when the opponent is above 10) always, since they can't get in as the enemy just plays bigger ones? I would suggest to not use narrow hate cards that are really strong against only 1 deck (like damping matrix - which is also very slow). Using stuff that is weaker but that hates on multiple archetypes is way better, because the overlaps you will have more hate for any archetype. And drawing a slightly weaker hate cards is a lot better than not drawing the 1-2 of "game over" hate card. Add some secondary color, it would allow you to play stuff like Engineered Explosives, Painful Truths - if you go black/red it gives Kolaghan's Command which is good against everything, and Stromkirk Captain - which solves the "they will run ya over with their bigger creatures!" problem. And splashing a second color can easily be done on budget, you need only 1 red mana on the 3rd turn, instead having all of your mana source being dual colored. However, if you aren't a fan of those, any on-color land is a fine option, as is Glory-Bound Initiate, Mardu Strike Leader, Dragon Hunter, Ruthless Cullblade, or Thalia, Guardian of Thraben (provided you'd be willing to relent about the 100% warrior ratio, of course). Something even more experimental would be Smuggler's Copter. Your creatures tend to have 3 power so it doesn't speed you up usually, but it gives you access to flying and lets you filter away dead cards in the late game. It also survives board wipes. Could be worth a try. Wrangle custa 2 de mana e 4 de ataque muito! Fallen Angel pode ser uma opo pro final do jogo. Indulgent Aristocrat pode ser uma opo boa se manter a maior parte do deck de vampiro. Com isso pode juntar Child of Night ou Ruthless Cullblade por exemplo, que tem baixo custo e o nico problema a vida baixa, o que se resolve por voc roubar e sacrificar os defensores do oponente. Outra coisa que achei nesse sentido que t um pouco redundante ter 16 opes diferentes pra sacrificar as criaturas, sendo que na prtica se sacrificar pra uma as outras continuam na mesma. Apostle's Blessing is in with the intention of it purely being paid with a generic mana and 2 life for protection. Protection from colors also means it can't be blocked by creatures of that color so it helps push the damage if there are any walls that would stop me. 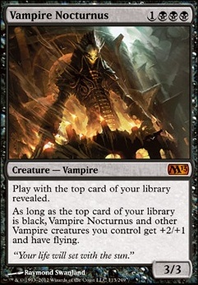 Sangrophage might work as pushing more damage is something witches doesn't do but I feel that Ruthless Cullblade would be paying one more mana for a creature that dies as easily as Guul Draz Vampire but doesn't get intimidate. The extra one power MIGHT push the game to a win but I don't see that one being the deciding factor in the match.